A man has been jailed for leaving another man with a partially severed ear. Ian Berry, aged 39, from London was sentenced to three years in prison for grievous bodily harm (GBH) with intent after he attacked a man in Crawley, resulting in the victim losing part of his ear. 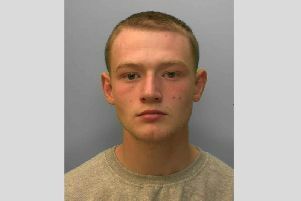 He was found guilty of one count of Section 20 GBH at Lewes Crown Court on August 15 and sentenced earlier this month. A 17-year-old boy, who cannot be named for legal reasons, was also found guilty of one count of Section 20 GBH and was sentenced to a youth rehabilitation order and 150 hours of unpaid work. The incident involved two victims, a 25-year-old man and a 38-year-old woman, who arrived at Three Bridges Railway Station at around 11.45pm on Monday, July 18, 2015, having caught a train from Brighton. According to British Transport Police, the pair were waiting in the taxi queue outside the station when the male victim started asking people for a cigarette lighter. He approached Berry and the teenager who were leaving the station and asked them for a lighter. Berry apparently took offence and attacked the victim, police say. Along with the 17-year-old boy, Berry knocked the victim to the floor and continued to kick and punch him as he lay on the floor, according to a police spokesperson. The female victim became involved in the altercation and was also kicked and pulled to the floor by her hair. After a few minutes, Berry threatened the male victim with a bottle before walking away towards the taxi rank. The male victim was taken to Surrey and Sussex Hospital for treatment. His right ear was partially severed and he had cuts and bruises to his eye. He had to have several operations to reconstruct his ear. The woman sustained minor injuries to her leg and hand. A 36-year-old woman was charged with assault and was found not guilty at court. Investigating officer, detective constable Vanessa Cottington, said: “This was an unprovoked attack on two members of the public at Three Bridges Railway Station. “It is not known why Berry decided to use such levels of violence against a man who he didn’t even know, but I hope that his time behind bars will make him think twice before he acts in such a manner again.